Is This Shattered Dimensions' Spider-Man 2099? A series of screenshots has slipped onto the web, showing off what looks like confirmation of Spider-Man's 2099 alter-ego Miguel O'Hara's appearance in Activision's Spider-Man: Shattered Dimensions. While we were expecting a big reveal of the third of four dimensions featured in Spider-Man: Shattered Dimensions, it looks like someone might have jumped the gun. All Games Beta posted these four screens, showing off the Spider-Man of Marvel's 2099 universe, where Ghost Rider is an A.I. inside of a skull-headed robot. Pre-order costume images previously appearing on GameStop's website hinted at Miguel O'Hara's spiky arm dealies, and this could very well be confirmation. Unfortunately we're not seeing any official image releases from publisher Activision, so until they tell us these are legitimate screenshots, we're going to have to remain cautiously optimistic. The game's official website still lists only two Spider-Man characters. If legit, Spider-Man 2099 joins the previously revealed Heroic Age Spider-Man and Spider-Man Noir as three of four webslingers represented in the game. 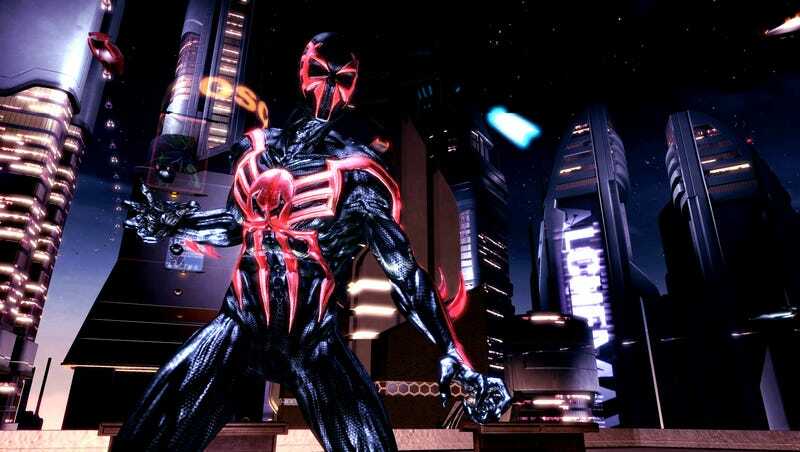 Spider-Man 2099 previously appeared as an unlockable costume in Activision's first Spider-Man games for the original PlayStation, as well as the Wii version of Spider-Man: Web of Shadows. He is also playable in the Marvel Super Hero Squad video game. Spider-Man: Shattered Dimensions is slated for a September release for the PlayStation 3, Xbox 360, Nintendo DS, and Wii.